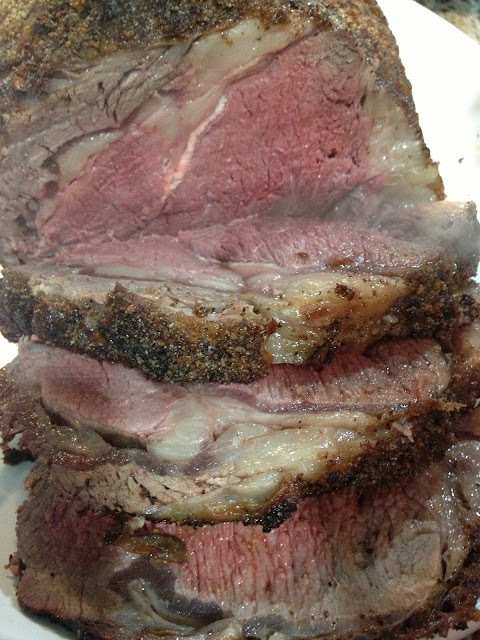 Take your prime rib roast out of the fridge 2 hours before cooking and let it sit and dry on the counter. 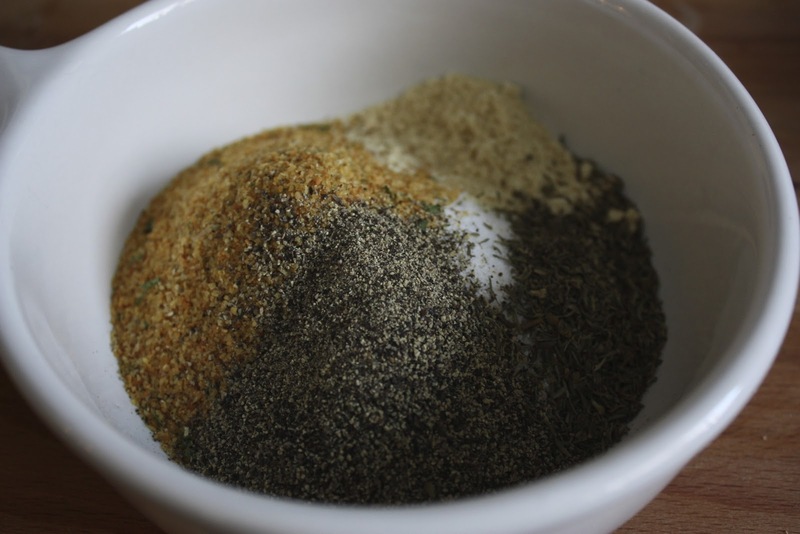 It must come up to room temperature before cooking to ensure it will cook evenly. Preheat oven to 200°F. Rub the roast all over with mixed seasonings liberally, then top with minced garlic. 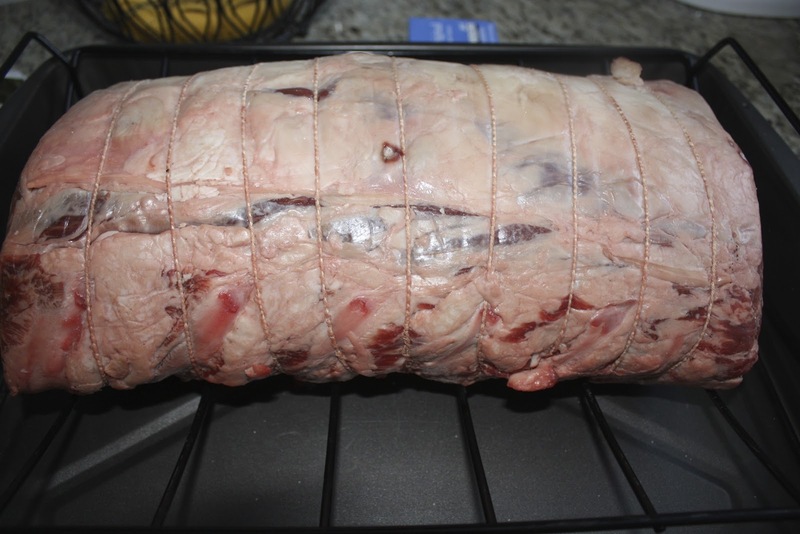 Place roast, fat side up, on a rack set in large roasting pan. Place plum tomatoes sliced in half and quartered onion in the bottom of the roasting pan, along with beef broth. Place in the oven and cook until center of roast registers 120 F on an instant-read thermometer. It averages to about 11 minutes per pound roughly. 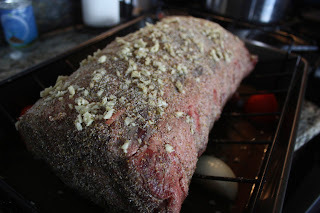 Remove the roast from oven and tent tightly with aluminum foil. Place in a warm spot and allow it to rest for at least 30 minutes, and up to an hour and a half. Meanwhile, preheat oven to 500°F. When the oven comes up to temperature, remove the foil tent and place the roast back in the oven. Cook until browned and crisp on the outside, about 8-10 minutes. Remove from the oven, carve and serve immediately. To make the Au Jus take the pan drippings, add 1/4 cup of red wine, a box of beef stock and some sauteed mushrooms. Season to taste and serve on top of the carved prime rib. 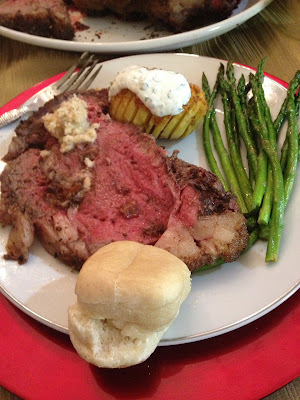 Don't forget to serve with some creamed horseradish for the ultimate prime rib taste!